We all crave for happiness, don’t we? If happiness fails to befriend us, we go behind it… in search of it. At times, we would fool ourselves with fake smiles. We convince ourselves that we are happy and that we are already experiencing the heights of happiness. Buddha said, “Each morning we are born again… What we do today matters most.” But are we really making good use of each day? Wake up morning – Go to office – Work… Work and work more – Earn – Climb up the hierarchal – Retire – And wait for death to kiss you! In the process of meeting the demands imposed by the family, peers and society, we forget what gives us true and uncorrupted happiness. We start to move with the flow and in that process, we may lose ourselves. 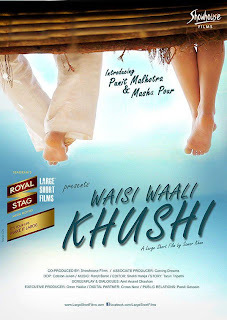 Waisi Wali Khushi - A large short film - directed by Samar Khan is all about finding happiness. Punit gets lost in his routine life. One fine morning, when Punit meets someone who is in a top management level, he introspects. He wonders what kind of life he is living and decides to seek happiness. The rest of the story is about if he really finds that happiness he was searching for. Punit Malhotra has done a great job. He looks good and reflects the fears of each one of us. He carries himself with ease and I could see a tremendous potential in him. Masha Pour comes across as a breath of fresh air. She has nothing much to do as far as the performance is concerned. But her presence itself casts a magical spell on the viewers. Director Samar Khan is promising and I am hoping to see him doing more of such good ventures. The movie is a feel good kind. It is only 11:34 minutes long, yet carried deep meaning with it. It is like a poem which expresses so much with so less words. You feel very happy towards the end of it. In almost all the scenes, you find yourself nodding. However, scenes with the tiger and the scenes where the protagonist wanders mindlessly is a little too lagging. It may be because of too much detailing. But, then, the short films should be crisp and well edited. I say this because a short film should never bore the viewer, not even for a second. So, I wished that the director and editor should have taken care of it. When Punit gets out of his shell and decide to seek true form of happiness, I prayed that I gain that courage too. We all are cocooned in fear. We are scared of what others will think about us. We are scared of failure. We always long to be number one. The first twenty years of our lives moulds us into a refined actor. A kind of actor who is capable of ignoring what heart says and following what the rational brain says. We tend to ignore our passion and lives. We forget our true-self in the end of it. Jim Morrison says, “Expose yourself to your greatest fears. After that fear has no power”. Really, I always wonder… why do we slog? We end up working so much that we find it hard to dedicate time to our family and loved ones. We fail to notice that wrinkle below the eyes of our ageing parents… We don’t take time to appreciate the new hairstyle of our spouse. We don’t really care enough to ask what our kids think about us. We don’t smell the new book and give time to read our old scribbling. We don’t hug our loved ones and never close our eyes to be with ourselves. All we do is raise with the Sun… Go to our work place… Stare at the laptop and tap on the same… Take food in a hurry and torment our weary eyes by sleeping late… We make money and save… Branded products become affordable and meals at five star hotels become reasonable. We buy posh bungalows… But we don’t find time to be there… We don’t find time to eat the food cooked by our loved ones; Remember… It will be sprinkled with love! In short, the movie talks about the simple joys in life. The movie asks us to stop surviving and start living… After all, as Ralph Waldo Emerson remarked, “Money often costs too much life!” And I can’t stop agreeing to it!